I showed you these mugs when they were green and drying on my shelf back in early april. Finally, finally, the finished results. I love these two fiddlehead numbers. In the background is a Sensitive fern and either a Resurrection fern or a small Christmas fern. Delta Zen colorway. My most favorite of this series was a dandelion leaf and blossom, which have always made me happy. Anybody see the old Japanese movie "Tampopo"? I was inspired by it back in 2001 to make a large dandelion platter- I might need to revisit that idea. Surely I'm not the only person who sees these are more than "just weeds." Even if they are weeds, you've got to admire their persistence. They are impossible to slay- a good characteristic for most of us to emulate, no? Of course the mug sold before I was able to get a picture. That always happens. Back to the mugs: I only glazed 8 of these mugs for the farmers market. There are several left to glaze for the next market. I need to root around in my mother's ferns and in my little fern patch to find more fiddleheads- these drew a lot of comments from shoppers, so I should find a way to keep making them. The problem with fiddleheads is that they are easiest to find in early spring. By the summer, most ferns aren't putting up new growth, and the pressed versions don't leave the best impressions in the clay. I'm revisiting some old work- this photo is from a 2003 commission for a wedding gift. I made 6 or 8 plates that were divided like bento boxes or those little kids' melamine plates. In this case, the bride didn't like it when her food touched, so her friends, my customers, asked me to make her this set. Because the concept seemed so bento-like to me, I used a lot of asian-inspired images. Here are Japanese maple and Nandina, which is also called heavenly bamboo. I also used horsetail grass, a type of fern that ended up looking like stalks of bamboo, some ferns, and ginkgo leaves. I used a glass light fixture cover as my mold. 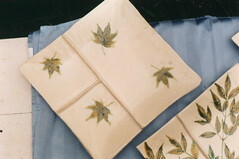 This is the same glaze combo that I use in all of my "delta zen" pieces, like Sarah's platter, below. *edited to add- we called them mezze platters because at the time, that was one of our favorite easy suppers. I'd go once a quarter or so to the mediterranean grocery in town and get cans of dolmas (stuffed grape leaves), jars of roasted peppers, homemade pita, fabulous thick labna, and all manner of other middle eastern pre-prepared goodness. The divisions in these plates, as well as their ample size, made us think that they'd be perfect for serving such an assortment of goodies. I need to go back to that market- it's closer now and I haven't been in years! This week we'll have mezze for supper. For anyone aspiring (haha- what a grand word!) to make work that looks similar to this- here's how I did it. I pressed the fern into the slab after I cut the shape. Let it dry, pulled out the fern (I always try to get more than one use out of each fern or leaf! ), bisque. I glaze the fern portion only (leaf and stem) with a deep, bronzy green, using a small paintbrush. Some areas have darker coats, some lighter. The lighter coats look more tan than green. I waxed over the green glaze (using the same tiny paintbrush), let it dry, then poured white glossy glaze over the entire piece. Sometimes beads of white glaze stay over the wax- sometimes I leave them, sometimes I brush them off. I love how the turquoise glow that happens where the white and the green meet. This is one of my favorite glaze combinations, but doing the ferns is pretty tedious, especially when you do what I do and wait to do 20 of these pieces in a single day. Makes sense in a glazing-materials and preparation way, but not in a keeping-the-potter interested way. Podcasts help me to break up the tedium. This platter is one of my very favorites of all that I've ever made. The fern is an oak fern*, one of the few ferns that will grow in full sun. I got a piece from my mother, before she moved back to TN. She got hers from a piece that was in a pot of something else, given to her by another gardening friend. I love this fern - truth be told, I love all ferns. This one is tall (3-4 feet! ), wavy, adds texture, and its rambunctious nature makes it a good fit for areas that would othewise be neglected. The oak ferns have really sprung to life over the past few weeks and the clump is happily expanding. I plan to make several more of these platters for my summer sale. *nope. it's bracken. my bad. I have a hard and fast rule about not letting myself complain on this blog- its purpose is exploring my thoughts about pottery, creativity, and to document how my pottery progresses over time. This week, however, I found that I didn't get in to a juried show that I'd participated in for the past five years. The rejection stung. I wondered if I wasn't accepted because of the change in format from slides to digital images, but after contacting the person who organized the jury pool in hopes of feedback, I realized that I just won't ever find out why, and why doesn't really matter in the end. One door closes, another opens. I am looking for those other doors that may open and reaching for some shows that I'd previously considered out of my league. This teacup was part of a set I made this summer as a thank-you gift for my son's first preschool teachers. Each cup had a different fern, ginkgo, or japanese maple leaf. I call this design of a single hazle-green leaf floating on a white background my "delta zen" series, and I've been making them since 2001. When I was in graduate school I wrote a paper on Mississippi Abstract Expressionist Dusti Bonge (of Biloxi). During the course of the research I went down to visit her studio three or four times, to look at her work,read through her papers, and play with her ideas*. She was very influenced by eastern thought and the idea of "zen space**," which drew me (I was not yet a potter) to examine the role of negative space in art. I am certain Buddhist scholars would scoff at my interpretation of Zen in my pottery, but I am an Episcopalian who is almost entirely unable to "let go," so I wouldn't make a good Buddhist at all. These pieces feel calming to me, so I'm going to persist in my calling them zen. *At the time, I painted, and inspired by her materials, I began covering my canvases with Joss paper, purchased at Vietnamese groceries, before roughing out my compositions. I no longer paint, but I did wallpaper my small hallway with hundreds of squares of Joss paper. **I may be closer aligned to writer and designer Alexandra Stoddard's ideas of Zen than the true Eastern ideals.